Onwards & upwards, the new Pinecastle album by Irish bandleader, broadcaster, and songwriter Niall Toner, has been receiving praise from country music reviewers. 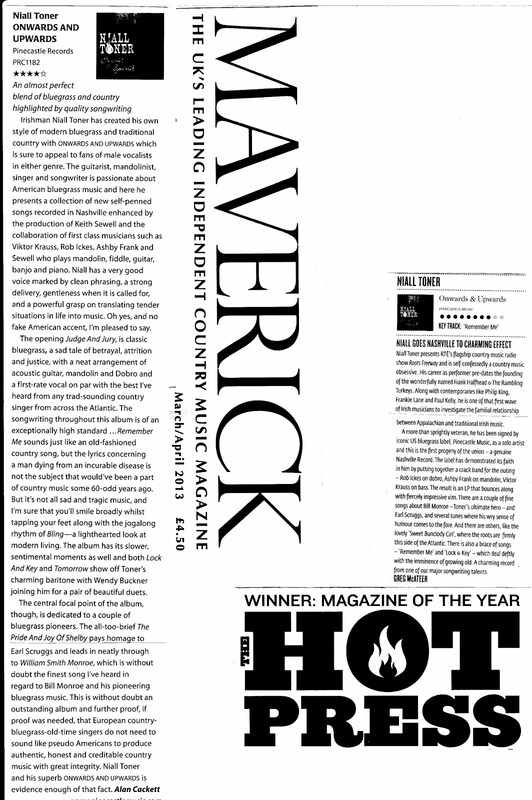 Niall sends the scanned image (left) of reviews by Alan Cackett in the UK's Maverick magazine and by Greg McAteer in the Irish magazine Hot Press. Click on the image to obtain a readable size of print. This is without doubt an outstanding album and further proof, if proof was needed, that European country-bluegrass-old time singers do not need to sound like pseudo Americans to produce authentic, honest, and creditable country music with great authority. Niall adds that the Maverick review has caused a sharp rise of interest in his work, especially since it came out in the USA last week, and may be responsible for his having also just hit the #1 spot on the AirPlay Direct all-time Bluegrass/Folk charts.